After great success with Kite Festival in January, HSS are delighted to invite you to our annual event of “Festival of Colours”. 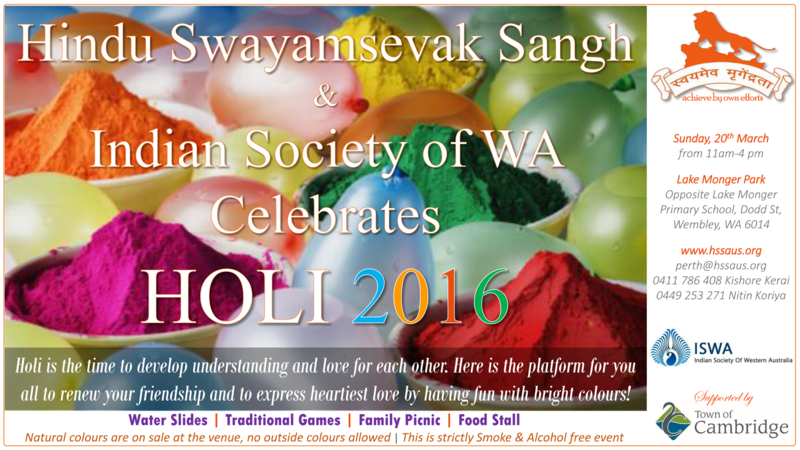 Hindu Swayamsevak Sangh (HSS) is celebrating Holi Festival (Festival of Colours) on Sunday, 20th March 2016 at Lake Monger Opposite Lake Monger primary school, Dodd St, Wembley from 11 AM to 4.00 PM. Holi festival has an ancient origin and celebrates the triumph of ‘good’ over ‘bad’. The colourful festival bridges the social gap and renew sweet relationships. Activities includes Indian games for all age groups, water games, water slides, Plenty of colours and food stall. We are using only non toxic and safe for kids colours. Kindly note that for safety of all participants, no other colours from outside are allowed. Colours can be purchased at the venue for nominal fee. Please join us with your family and friends to celebrate the festival of colours. We will have plenty of fun filled events for everyone. Colours and food stalls will be available at the venue. We kindly request your presence on time.